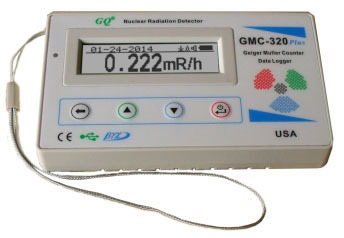 The GMC-320P is a full-featured radiation detector/geiger counter/data logger. Highly sensitive, easy to use, and wide range allowing much higher radiation readings than our previous pocket detector. There is no question that this is the best value, easiest to use, and most sensitive Radiation Detector you're going to find. Ideal for both the novice that wants a simple one-button geiger counter, to the advanced user that requires multiple display modes, computer interface and graphing. This unit has it all. It is called a Radiation Detector and not a Geiger Counter because it does far more than an ordinary Geiger Counter does. 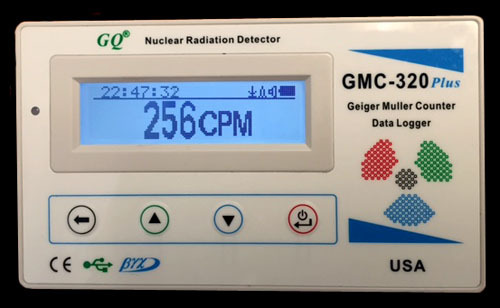 It displays radiation measurements in standard CPM (counts per minute), international µSv/h, U.S. standard mR/h, or as a graph. It will even output the data to your computer (software included!). This is truly the perfect personal radiation detector. Worried about food, water & air contamination? What about radiation levels around your home? The GMC-320P is what you need. Unlike other small detectors, this unit can also be used for Uranium prospecting and measuring higher radiation levels from X-Ray tubes, etc, not to mention very low levels such as natural background radiation. Indicates levels of Beta, Gamma, and X-Ray radiation by a series of audible 'clicks' and 'beeps' with flashing red/green LED (depending on radiation intensity) as well as a large LCD digital display with clearly defined numbers (with LED backlighting) so readings are visible in total darkness. Font size is selectable. The pocket size makes it very convenient for industrial, covert & general use. Geiger Counters typically have a separate probe requiring 2 hands to operate the unit. The all-in-one design of the GMC-320P allows you to operate it with one hand leaving the other free. The unit has a built-in lithium-ion rechargeable battery. A standard USB charging cable and software disk are included. The USB cable also functions as a computer interface cable should you want to output data to your computer. The detector in the unit is an industry standard Halogen-quenched thin-wall metal Geiger-Mueller tube. Applications for the units are many and may include checking for food & water contamination, environmental contamination, scrap metal contamination, industrial, clinical, field, school classroom, home use, or wherever radioactive materials are present. Perfect for amateur as well as professional use - unmatched for its simplicity, convenience and sensitivity. Ideal for workers handling radioactive minerals, metals, and isotopes who are concerned about bringing home contamination on their clothes. Unit comes with a 1 year warranty and is ready to use right out of the box. operation of the unit can be verified at any time. LCD digital display with LED back light. USB Data port for connection with PC using included software. USB DC input port for external power input, for continuous monitoring. High speed counter circuit for high range CPM counting. Once mega bytes on-board flash memory for history data record On-board speaker. Accepts both rechargeable and non-rechargeable 3.6V/3.7V battery. External DC power operation for continuous use. Text mode provides maximum data information. eg. CPM, Date, Time, Elapsed time, uSv/h, mR/h etc. 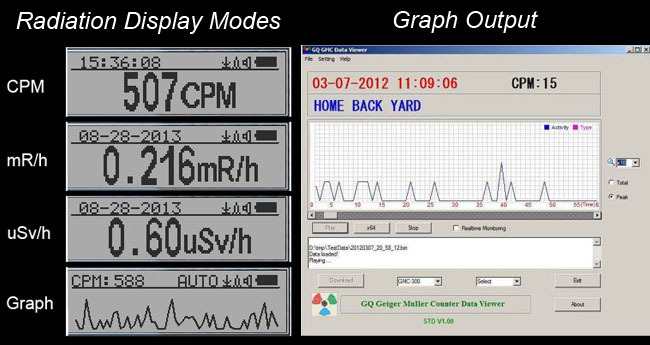 Real-time graphic mode provides real-time radiation changes, making it easier to observe subtle changes in radiation levels. ZOOM feature let user to see from lowest to highest graph onscreen. Back light Control to set the back light ON,OFF and timeout (to save power). Battery type selectable in software.For rechargeable or non rechargeable. Radiation alarm setting. Alarm ON/OFF, alarm type, alarm level. Date time set & real-time clock. Temperature display in Celsius OR Fahrenheit. Invert display setting. Auto 180 degree invert display provides a convenience reading when unit upside down. Three points calibration. For CPM to uSv/h and mR/h conversion. Power saving mode lets the unit keep running at minimum power. Data saving mode selection. let unit record data every second/minute/hour. Up to 7 days history data. Variable serial communication baud rate.